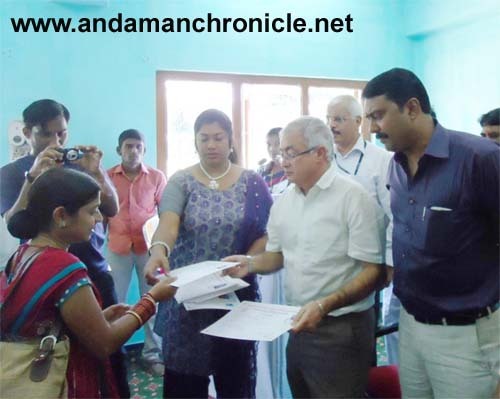 Port Blair, Dec. 18: The Chief Secretary Anand Prakash IAS today inaugurated another free centre of tailoring and fashion designing opened by the Andaman and Nicobar State Cooperative Union at Haddo No: 2, for the benefit of the rural women. Anand Prakash is his address on the occasion stated that time has come when all womenfolk, especially of the rural areas need to know that their identity also keep same importance which their counterparts have. He recorded his happiness to witness such a good number of womenfolk who came for skill training. The CS also stated that skill trainings are good for those who want to establish their independency. Such trainings are the root of social and economic developments and hence more and more women should come forward for such trainings made available free of cost by the Union. The Chief Secretary also praised Kuldeep for the overall development of the people of these islands. In his welcome address the Chairman of ANSCU Kuldeep Rai Sharma said that the Union is always taking care for upbringing of the womenfolk of these islands, especially in the rural areas. He said that since there is no scope or very little scope of employment in Govt. Sector, it is high time for everyone to have some skill related training and create self help groups or cooperatives and earn their livelihood independently. He also informed that as on date the ANSCU has opened 21 such training centres where about 1500 ladies and unemployed girls have got training. Many of them have started their own business. The team of ANSCU has also proposal to cover the entire Andaman and Nicobar Islands. The DGM NABARD Thanvi on the occasion stated that after passing out, the womenfolk may avail loan from the ANS Cooperative Bank and start their business. He has also suggested that these trainees may also be trained in preparing clothing of men. The Secretary Cooperation NK Sharma has recorded his pleasure to the fact that ANSCU is doing very well in cooperative sector. Ward Councillors Hema Rao and Nair were also present in the function beside PRI members, Vice Chairman ANSCU Biswarup Banjerjee, MD ANS Cop Bank Ravinder Rao, Ramlal GS ANSCU and other dignitaries. The Director ANSCU PG Paul has proposed vote of thanks.